From brick paving to retaining walls to pools, hardscapes add sturdiness and durability to a yard. They are thus in high demand among both individual homeowners and public professionals, both of whom want to protect their properties while adding an artistic flair. Squeals Landscaping offers hardscapes in a wide variety of materials, allowing you to maximize both aesthetics and functionality. Operating across the Metro Detroit area, we have the experience and equipment to handle even the most complex outdoor constructions. Weather Resistance - Extreme weather can disrupt your yard, uprooting plants and moving outdoor furniture around. Retaining walls provide a barrier against these conditions. Improved Accessibility - Through brick paving, you can give visitors a solid, clear path into your home. This is particularly valuable if any of your friends or family members have mobility issues, as walking over an unpaved area may be difficult for them. Higher Property Values - Hardscaping not only adds beauty to your yard but also makes it appear more secure. Both of these results can bolster your home’s value. Businesses and public offices can obtain the same benefits by investing in hardscapes. Squeals is happy to provide these and other enhancements to our clients. 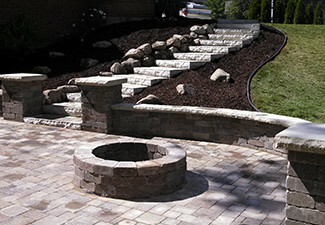 While landscaping and hardscaping can each improve your building on their own, they work best when provided in tandem. As a landscape architect team that is also skilled in pool hardscaping, Squeals has no trouble combining these two functions. We use retaining walls to protect your trees and shrubs from weather and other forms of harm, or to guide visitors safely along your swimming pool through the strategic placement of plants. 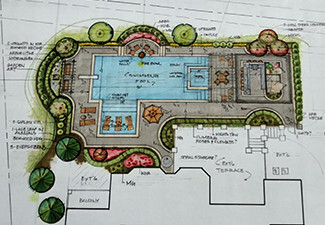 In this way, we give your yard a feeling of completeness, with every aesthetic and functional feature working together. Comprehensive Consultations - We are happy to visit your home or building, survey the landscape and advise you on what types of walls and paths would do the most to enhance it. If you already have plans, we will listen to them and figure out how to make them work. Accurate Estimates - We provide precise quotes for the cost of our services, making it easy for you to determine if they are in your budget. Savvy Selections - We keep a wide array of brick and stone types in stock, allowing you to select whichever material best fits your needs and desires. For more information on hardscape design for public, commercial and residential properties, contact Squeals Landscaping at (248) 360-7000 today.